Home Why are my Toyota's brakes making noise? Why are my Toyota's brakes making noise? Noise from your brakes can mean many different things. One of the most important components on your Toyota are the brakes. We use our brakes all the time without a second thought. We just assume when we step on the brake pedal, our car will stop. It's not until there is a problem do they demand your attention. The first sign that your brakes might need attention is usually brake noise. Brake noise can be any thing from a small squeal or squeak to a horrible grinding noise. What does it mean when my brakes make noise? There are several different brake noises you might hear. Many brake pads have wear indicators built into them. These indicators are little metal tabs that scrape against the brake rotor when the pads wear down to minimum specifications, alerting you that it’s time to replace your brake pads. 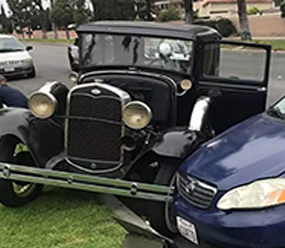 This noise is normally a high-pitched metal sound that is present while the wheels are turning, and disappears when the brake pedal is applied. 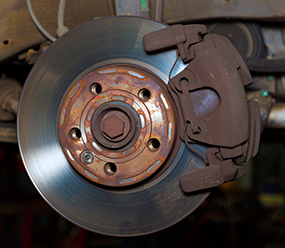 A metal grinding sound when braking is usually a serious indication that something is wrong. It suggests that the brake pads have worn down too far and damaged the rotors. If the rotors are damaged, they probably cannot be resurfaced on the brake lathe and will need to be replaced. Note: Brakes do not always maken noise before they wear out. Sometimes the first symptom to arise is that grinding sound, and then it’s too late. That is why frequent brake inspections are a good idea.